Living with chronic joint pain? We know it is tough and extremely difficult. Here’s a quick read on joint pain and knee pain to help you live well. From Ayurvedic medicine and healthy diet to exercise, over here we discuss 8 ways to cope with joint pain. Excessive weight puts pressure on your joints (feet, knees, and hips). Lose weight to reduce the stress on your joints. 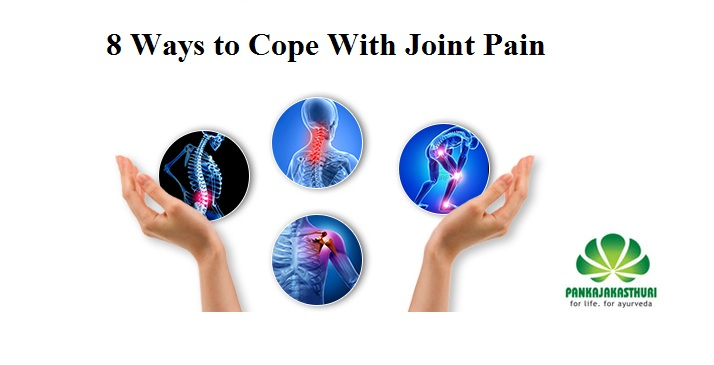 This will reduce joint pain, andprevent any further damage to your joints. Exercise not only helps you lose weight. But also helps maintains the flexibility of your joints. Avoid heavy exercises as they can worsen the situation. Instead, try low-impact exercises. Practice meditation and relaxation techniques. These activities help you cope withthe pain in a better way. Regularly massage the affected area. This helps in reducing pain and stiffness. It also helps in improving your mobility and range of motion. Use our Orthoherb Oil http://www.pankajakasthuri.in/otc/orthoherb-oilfor better results. This Ayurvedic pain killer oil can be used by patients suffering from all types of inflammations of joints and muscles. It’s anti -inflammatory and analgesic. It lubricates the joints and increases circulation. Orthoherb oil has the goodness of 19 different herbs which easily penetrate the skin and deliver the medicinal properties to the muscle cells and joints in the body. This is a 100% natural product and has no side effects. Drinking alcoholic beverages affects your sleep. Without enough sleep, your stress levels will increase, which in turn will worsen your pain. It’s because smoking worsens your pain. In case you suffer from Rheumatoid Arthritis, smoking can cause flare-ups. It’s because smoking triggers a genetic chain of reactions that can worsen your pain. Your doctor needs to know how you are feeling between the visits. Maintain a journal. Note down the activities that intensify your pain. This will help you understand the nature of your flare-ups. At the end of the day, note your pain levels. When you visit the doctor, take the notebook with you. This will help your doctor understand your condition better. A well-balanced diet helps you in many ways. It not only boosts your digestive process, keeps you healthy, and reduces the risk of heart disease, but it also keeps your weight under control. Low weight reduces stress on your joints and keeps them healthy. Also, essential vitamins and minerals strengthen the muscles around your joints. Choose a low-sodium, low-fat diet. Include fresh fruits and vegetables, whole grain cereals and beans, low-fat cheese, yoghurt, milk, and lean meats. A healthy diet leads to unobstructed and clear bowel movements causing proper detoxification. If the bowel is clear, it is good for the patients. Also, find ways to distract your mind from pain and focus on things you enjoy. When you focus more on pain, it gets worse. Keep yourself busy in activities you enjoy. Initially consume 2 tablets three times daily. After 2-3 months this can be reduced to 2 tablets twice daily, gradually with the improvement in condition of the patient. Children half the adult dosage or as directed by the physician. Since it is not a pain killer, it is suggested that the tablets are taken for 3months. Ayurveda is not only about medicines. It’s also about following an effective lifestyle regimen that cleanses and detoxifies our bodies.